One after the other, the countries around India are falling prey to China's predatory economics. After Pakistan and Sri Lanka, Maldives has become the latest victim of it, according to US-based think tank Atlantic Council's analysts. India has always enjoyed a special relationship with the island country. Both got freedom from Great Britain and the former helped the latter in rebuilding its economy. But this is now changing, as China is ferociously diminishing India's sphere of influence in the Maldives. The red dragon with its economic might is using debt-trap to create dependent states in the Indian Ocean region. In the Maldives, where China did not even have an embassy until 2012, is now receiving large-scale investments from the Asian giant, Robert A. Manning and Bharath Gopalaswamy write in the Foreign Policy. To begin with, Xi Jinping's regime is upgrading an airport in the client country at a cost of $830 million. The project also includes a 1.3-mile bridge to link the airport island with the capital and this alone costs $400 million. The Chinese are also building a 25-story apartment complex and a hospital. According to the opposition parties, with such investment projects, the tiny nation of just over 4 lakh people now has accumulated a huge debt and has to pay $92 million a year in payments to China, roughly 10 percent of the entire budget. The Maldives archipelago has also "leased the uninhabited island Feydhoo Finolhu for tourism use for 50 years," according to the Asia Times. It is by using this debt-for-leverage model, China is finishing India's influence in the Maldives. "Debt-for-leverage model is based on providing Chinese financial support for infrastructure projects in exchange for access to the natural resources of the beneficiary nation," the two analysts quoted Brahma Chellaney, a professor at the New Delhi-based Centre for Policy Research, as saying. The two further opines that "The Maldives is on the verge of conceding its sovereignty to Beijing as a direct consequence of Chinese business taking advantage of the economic opportunities." 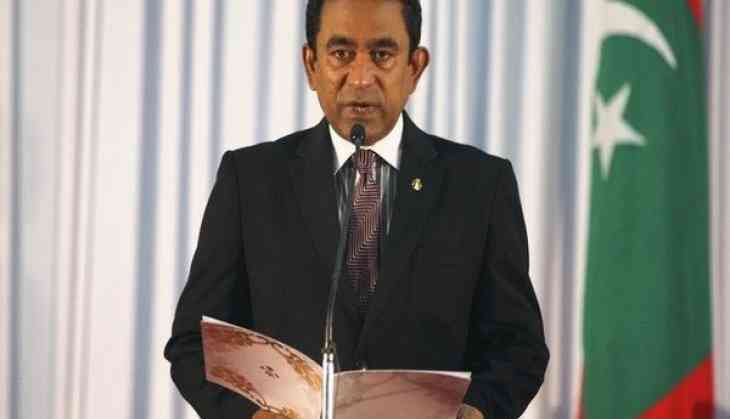 To back their observation, they have highlighted President Abdulla Yameen's, who has declared an emergency in the country, Chinese connection. Opposition leaders have accused the president of allowing Chinese to grab 16 islands and inflating the costs for personal gains. "In addition, during a meeting in early December with Chinese President Xi Jinping, Yameen signed a free trade agreement, which he rammed through parliament, allowing legislators only one day to approve it," the two analysts write in the article. And, it is this connection that led to protests against Yameen, who declared a state of emergency last month and ordered the arrest of Supreme Court judges after they ruled for the release of opposition politicians. Yameen has also caught U.S. attention after Maldivian tankers, according to Japan, have been found secretly transferring goods to North Korean-flagged ships, in grotesque violation of U.N. Security Council sanctions. Concluding by pointing out that the recent internal crisis has stifled the tourist-dependent Maldivian economy, the two analysts write that with China using its debt dependency model has initiated a Great Game, the only difference is, it is now being played in the Indo-Pacific region, as opposed to in Central Asia.